The Football Front: Contracts in Football - Are they worth the paper they are written on? Contracts in Football - Are they worth the paper they are written on? Leanne Duckett explains to The Football Front the true value of contracts and whether they have real value. The thing in football that baffles me most is ..... CONTRACTS!! Do they actually mean anything? As an HR Advisor this may be a little surprising but it seems Football as a business is totally exempt from the normal everyday HR structure that other businesses run to. By its very definition a contract is there to in-still "mutual confidence and trust" it seems ‘confidence’ and ‘trust’ are the missing elements in the Mancini -Tevez affair. 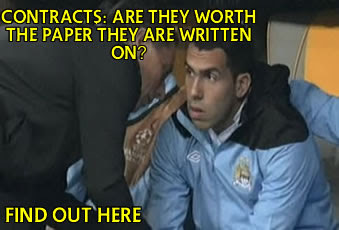 So, the key question is has Tevez breached his contract? 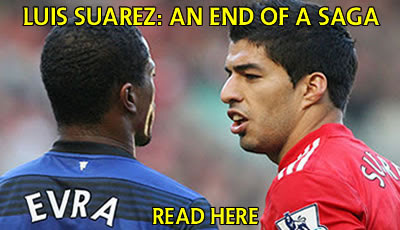 Well, he allegedly refused a request from his manager to play against Bayern Munich in the Champions League. Manchester City then suspended him for a maximum of two weeks, on full pay whilst they conducted an investigation into the incident. Tevez was then fined 4 weeks wages, close to a £1 million pounds, and was training with the youth team. Some of the options available to City are, to retain Tevez's registration until 2014, leaving him unable to play any competitive football, except for Argentina, until the registration expires. Or, they can sell him, his former club, Corinthians are said to have expressed interest in taking him back for around £16-£18 million, almost a third of the £47 million City paid for him. Man City Chairman, Sheikh Mansour however has stated no cut price deals will be made. This is not new territory that Tevez finds himself in. At the end of his time with Corinthians he refused to play, thus to push forward his transfer to West Ham United. Carlos Tevez is well known for his sulking and petulance which is a massive shame, considering how talented he is. Tevez did initially receiving the backing from the PFA in his claim against Mancini for defamation of character. But since he’s gone AWOL, presumably back to Argentina, this sour affair shows no signs of being settled this year. Champions League club representatives have urged FIFA to take a tough stance against Carlos Tevez if his self-imposed exile from Manchester City leads to the end of his contract.